Several news sources are reporting on the increased persecution of Christian house churches in China. When China fell to the communists in 1949, the atheistic government discouraged any practice of religion and missionaries were basically removed from the country. For the next thirty years, Christians in the West were left to assume that the church had been stamped out by the state. However, once relations softened between the Chinese government and the West, we were surprised to see a populous and thriving house church movement that seemed to increase under persecution. This reminded me of the quote by Tertullian in his Apology for the Christians and it makes me ponder two thoughts. While martyrdom has been "the seed of the church," Tertullian also said that Christians don't hope for it for its own sake, but that the truth of Christ may claim ultimate victory. So we should pray and do what we can for all those persecuted for the name of Jesus across the globe. 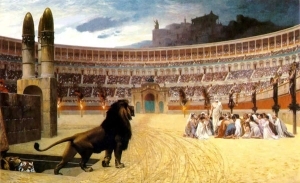 Secondly, with the western church so soft, I wonder how we would embrace such a calling as martyrdom. Would we see it the way Tertullain and those in his day did? If not, then what do we love more, Christ or our comfort? WHAT reason then, say you, have we Christians to complain of our sufferings, when we are so fond of persecution; we ought rather to love those who persecute us so sweetly to our heart's content. It is true, indeed, we are not against suffering, when the Captain of our salvation calls us forth to suffer: but let me tell you, it is with us in our Christian warfare as it is with you in yours, we choose to suffer as you choose to fight; but no man chooses fighting for fighting sake, because he cannot engage without fear and hazard of life. Yet, nevertheless, when the brave soldier finds he must engage, he battles it with all his power, and if he comes off victorious is full of joy, though just before not without his complaints of a military life, because he has obtained his end, laden with glory, laden with spoil. And now, O worshipful judges, go on with your show of justice, and, believe me, you will be juster and juster still in the opinion of the people, the oftener you make them a sacrifice of Christians. Crucify, torture, condemn, grind us all to powder if you can; your injustice is an illustrious proof of our innocence, and for the proof of this it is that God permits us to suffer; and by your late condemnation of a Christian woman to the lust of a pander, rather than the rage of a lion, you notoriously confess that such a pollution is more abhorred by a Christian than all the torments and deaths you can heap upon her. But do your worst, and rack your inventions for tortures for Christians—it is all to no purpose; you do but attract the world, and make it fall the more in love with our religion; the more you mow us down, the thicker we rise; the Christian blood you spill is like the seed you sow, it springs from the earth again, and fructifies the more.